As a parent, I worry about a lot of things when it comes to my son. I know you Moms know what I mean… from little silly things to the biggies. One of the biggies for me is bullying. Although my son has never been bullied, it’s one of the reasons (not the main one) I will be homeschooling my son through middle school. He will be in the fifth grade next year and we have been more than happy with his elementary school, but I’ve just heard too many stories about middle school, that we’ve decided homeschooling would be our best option. The only experience I’ve personally had with bullying was when I was a senior in high school. There was a boy (he was probably a freshmen) whom, I’ll refer to as Sam, that almost always sat by himself on the bus, unless I sat with him. He was several years younger than me. He wasn’t a clean boy. His family was poor. I know that was no excuse whatsoever for him to be dirty or his clothes to be unkempt and dirty. No excuse. However, this was no excuse for him to be picked on. No excuse. One particular day sticks out in my mind. Sam was sitting by himself and a junior girl started making fun of him. It wasn’t the first time she’d done this. But it was the first time I stood up and stopped it. Enough was enough, and I was ashamed at myself for waiting so long to say something. This had been going on all year, and the school year was about 3/4 over. But better late than never, I guess. Even though the girl was a year younger than me, she was much bigger than me (I only weighed 82 pounds when I graduated high school), and at the time, I wasn’t one for confrontations. Yet that day, I’d just had enough. I got up and went and sat by him and I told her to stop. She gave a nervous laugh and told me to mind my own business. I told her I’d made it my business and if she said one more word to him, or ever laughed at him again, she would answer to me. And something funny happened. She said, “Whatever.” Turned around and never, ever, said anything to Sam again. Why hadn’t I spoken up earlier? If I had known how easy it would have been, I definitely would have. This was many years ago. Today bullies are meaner. Nastier. And can use anonymity to bully, by cyberbullying. The cowardly way to bully. I’m teaching my son to not sit idly by if he witnesses bullying. If he feels safe enough to say something then and there… if not, go tell a teacher, parent, or other adult. Especially if someone is being physically hurt. I know how sick to my stomach I feel when I hear that a child was bullied and someone video taped it while others just stood by and did nothing, or worse… cheered it on. That is unacceptable behavior. By signing this pledge you are using your voice to say NO to bullying. Will you Take Part? 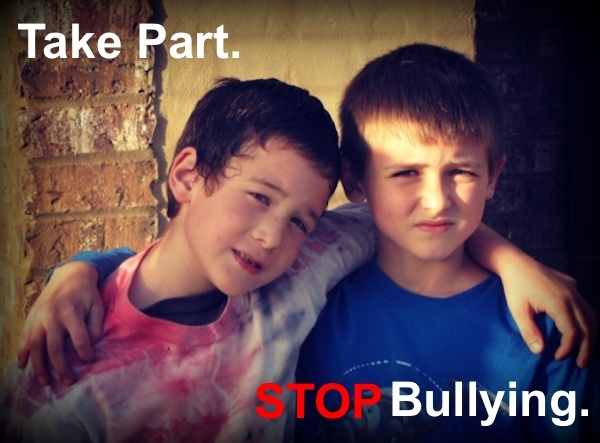 Together we can stop bullying. It’s much appreciated… thank you! As a mom of 3, I worry about them getting bullied all the time. Thanks for bringing awareness to this important topic. I took the pledge. MY kids are still young but I have already noticed a lot of bullying. It seems that kids are meaner now more than ever and it breaks my heart. I signed the petition already. It’s a great cause. Hi Donna. I signed the petition! Thank you for sharing. This is an issue that is near and dear to my heart. I do not have kids (yet), but I remember what being in school and being bullied is like. I was a fat kid, so much so that I weight 220 pounds when I was 12. Childhood obesity was just becoming a “thing” when I was in school. I was also a nerd, so that didn’t help. 😉 I was bullied for my weight in elementary school and middle school, when I became depressed and developed an eating disorder and tried to commit suicide–ended with my stomach being pumped. My poor parents! Things were slightly better in high school only because I developed an attitude that I didn’t care what people thought and hung out with older (college) kids. I came out as gay in high school, and regardless of your personal opinions about that, there’s no denying it will lead to bullying. Now I’m a huge advocate against bullying! And while I don’t want kids to get bullied, I do want those who ARE to know that they are capable of growing up into strong, beautiful, capable adults. Tara, thank you for sharing a little of your story. It moved me to tears. What a beautiful and special person you are. As I mentioned on FB, I don’t want my son to ever experience bullying, in any shape or form… it would just break my heart. So I want to do all I can to bring awareness to it. It really must stop.